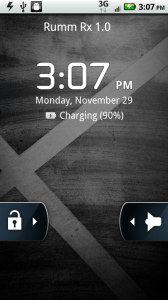 Our buddy, original Droid ROM master, and Droid Life wallpaper app developer JRummy, has returned with his first ROM for the Droid X called Rumm RX. It’s a almost Blur-less ROM, but has a few of the essentials left which seems to give it a good overall feel. He’s tweaked some things like the battery meter, added a bunch of scripts, tossed in some source built apps, and of course used the now popular “fancy” animations that you’ll notice when switching between any screen. This is good stuff. It’s built off of the 2.2.1 leak so you’ll have to be running that in order to flash this. And I’m sure there will be a variety of themes on the way if their aren’t already. 2. Do I need to say it again? YOU HAVE TO BE RUNNING 2.2.1. 4. You need to have Koush’s Bootstrap Recovery. 5. Open the DX Bootstrap and “boostrap” the recovery. 8. Choose “backup” to make a clean backup of your phone. 9. After that choose “wipe data/factory reset” to wipe your phone. 12. Your phone will apply the ROM. When it finishes, reboot and enjoy! Let us know if you run into any issues along the way and don’t forget to drop into our IRC channel for live support! Donate here. Support thread here. Verizon Photoshop is Painfully Bad, DROID X Now Runs iOS?